There are so many reasons I enjoy baking with Jasper. I love to see the spark in his eye as he runs to get his apron whenever I suggest we make something. 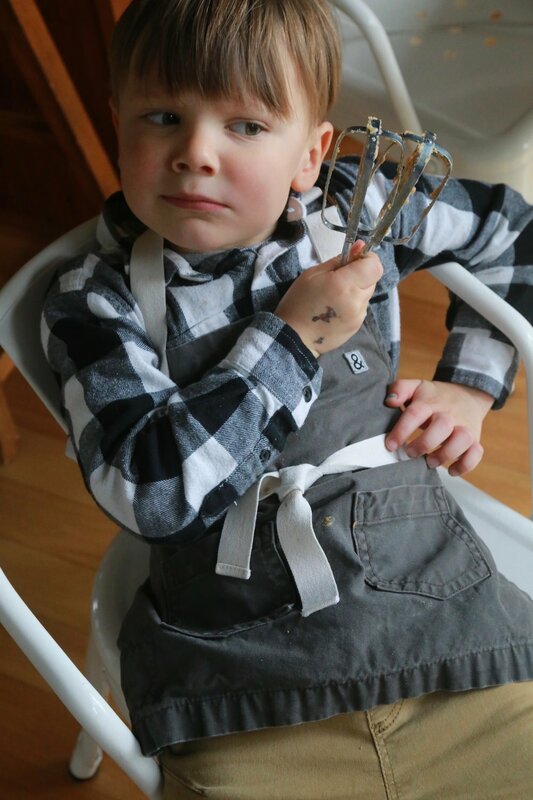 I love his enthusiasm when he sees a table full of ingredients and for his confidence to work the hand mixer all on his own (each time I hold my breath waiting for the beaters to rise up out of the bowl and make a gigantic mess). 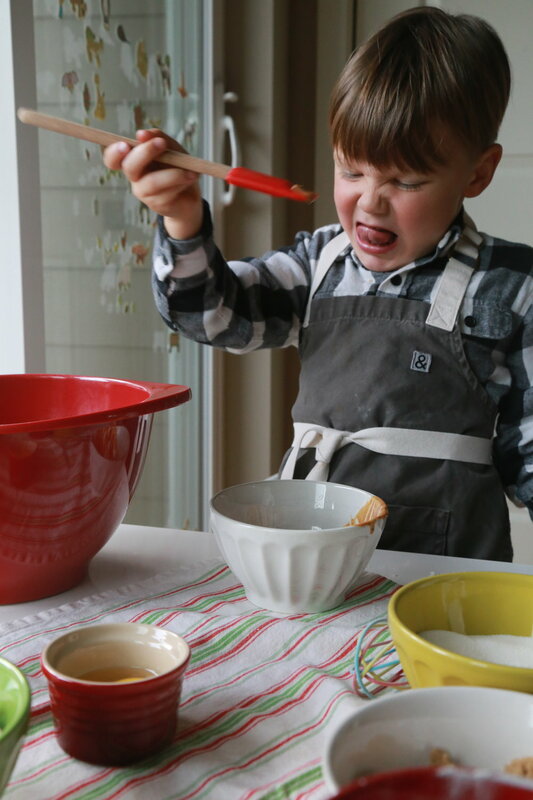 Aside from the unparalleled one on one time we gain from this activity I love to see him learning the subtle differences between a tablespoon and a teaspoon or baking powder and baking soda. I love to watch him sneak a pinch of sugar here and there and stuff as many chocolate chips in his mouth as he can before I act like I notice. If there are two gifts I hope to help cultivate in Jasper it would be confidence and contentment. Despite what others may think I want Jasper to feel as though he is good at a variety of things. At the very least I want him to know how to do a wide breadth of things. I want him to feel contentment in the fact he can create so much beauty and goodness with his two hands. Whether that be in the form of food, art, or music etc. I want his hands to be the catalyst for much joy in his life and the world. 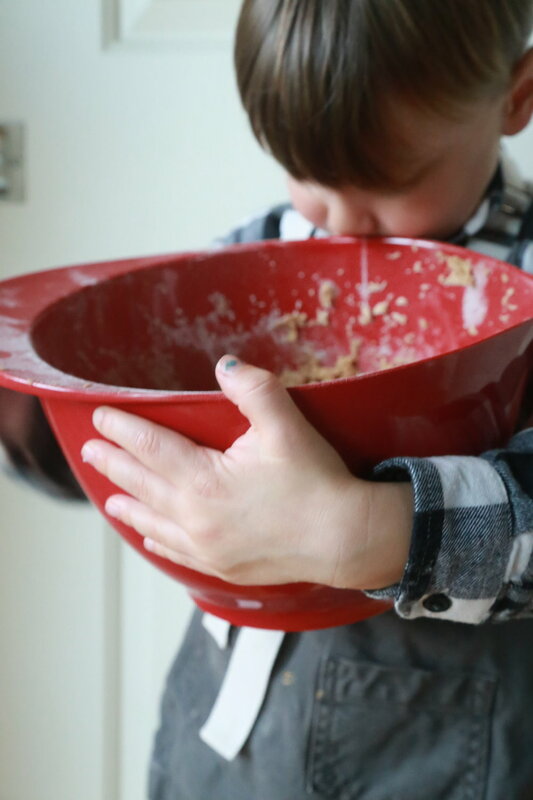 Maybe he will become a great chef or maybe he will just know how to make the perfect chocolate chip cookie. 1. Heat oven to 375°F. In large bowl, beat 1/2 cup granulated sugar, the brown sugar, peanut butter, butter and eggs with electric mixer on medium speed, or mix with spoon. Stir in flour, baking soda and baking powder. 2. Shape dough into 1-inch balls; roll in additional granulated sugar. Place about 2 inches apart on ungreased cookie sheet. 3. Bake 8 to 10 minutes or until edges are light brown. Immediately press 1 chocolate candy in center of each cookie. Remove from cookie sheet to wire rack. Above all else I love capturing Jasper’s expressiveness. He is so fun and light hearted I love capturing his wacky personality and this period of his life.